Tag line: "The boys are back in town. Nick Nolte is a cop. Eddie Murphy is a convict. They couldn't have liked each other less. 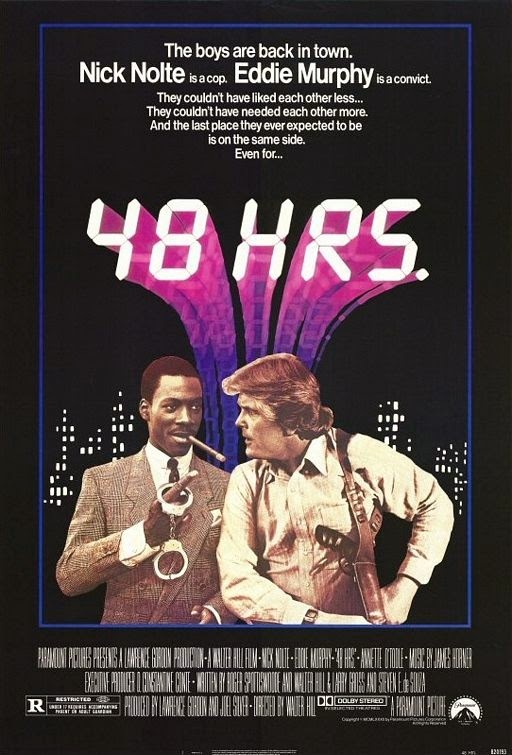 They couldn't have needed each other more"
48 Hrs, an action / comedy directed by Walter Hill, marked the big-screen debut of actor Eddie Murphy. This may not seem like much nowadays, but believe me in 1982 it was a big deal. After making people laugh for years on television’s Saturday Night Live, most knew it was only a matter of time before Murphy made the transition to film, and based on what he showed us in 48 Hrs, it was clear to everyone he was going to be one hell of a movie star. Jack Cates (Nick Nolte), a hard-nosed detective with the San Francisco police force, is hunting a couple of ruthless cop killers: Albert Ganz (James Remar), who recently escaped from prison, and a Native American who goes by the name Billy Bear (Sonny Landham). Looking to get the upper hand on the two criminals, Cates enlists the help of Reggie Hammond (Murphy), a former member of Ganz’s gang who’s currently serving 3 years for armed robbery. After pulling a few strings, Cates gets Hammond a temporary release from prison, which will expire in exactly 48 hours. With no time to lose, the two set to work immediately, and during the course of their investigation Cates discovers that Hammond has his own reasons for wanting to see Ganz back behind bars. In fact, he has half a million of them! 48 Hrs is far from a one-man show. Nick Nolte is excellent as the gruff Cates, a no-nonsense detective following up on every possible lead while, at the same time, spouting off a series of insults (not to mention a few racial slurs) aimed at his new “partner” (to say the two don’t get along would be an understatement). Also strong is James Remar as the cold-blooded killer, Albert Ganz; and director Walter Hill stages some fine action scenes, the best of which involves a high-speed pursuit down a busy city street, with Cates and Hammond chasing a bus that Ganz and Billy Bear had stolen. That said, 48 Hrs belongs to Murphy, who, despite having never appeared in a film before, displays all the confidence of a seasoned Hollywood pro. From the moment we first meet Reggie Hammond, belting out the lyrics of The Police’s "Roxanne" as he sits in his prison cell, he’s the most interesting character in the film. His tempestuous give-and-take with Cates set the standard for the “Buddy Cop” sub-genre (influencing everything from Lethal Weapon to Hot Fuzz), and the scene where, posing as a policeman, Hammond subdues an entire redneck bar is easily the highlight of the movie. More than a great action/comedy, 48 Hrs trumpeted the arrival of a new star, one who would set the box office ablaze through much of the ‘80s with films like Trading Places, Beverly Hills Cop (and its sequel), and Coming to America. In 48 Hrs, you get a chance to see the spark that ignited that flame, and this alone makes it a movie you won’t want to miss.